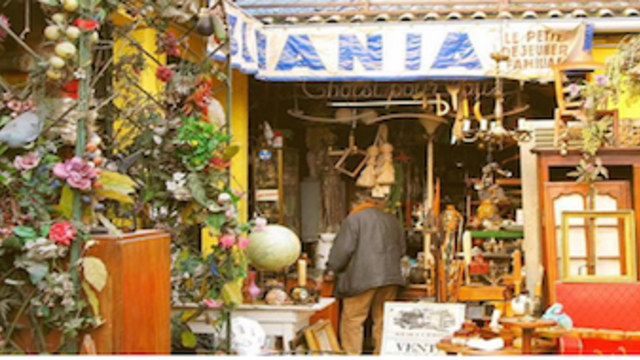 This Paris Flea Market walking tour introduces you to the world’s largest flea market – 15 markets, +2,500 shops, and everything French art ever produced, from 1960′s vintage clothes to refined 1600′s furniture and religious art of 800 years ago. 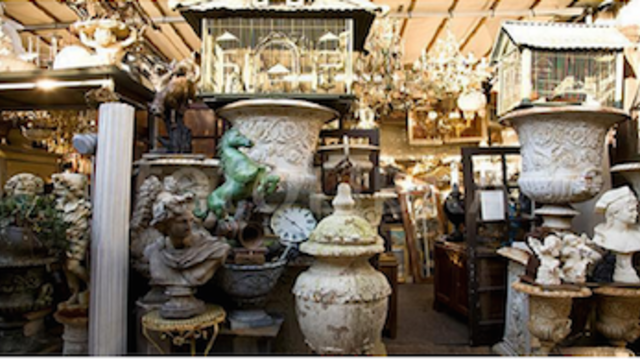 The variety from these amazing antiques to cheap shoes & rap music is pretty astounding. Not homogeneous, that's for sure! You really need a tour guide because the Flea Market is enormous and intimidating. You can't discover the Market on your own....unless you are a local. 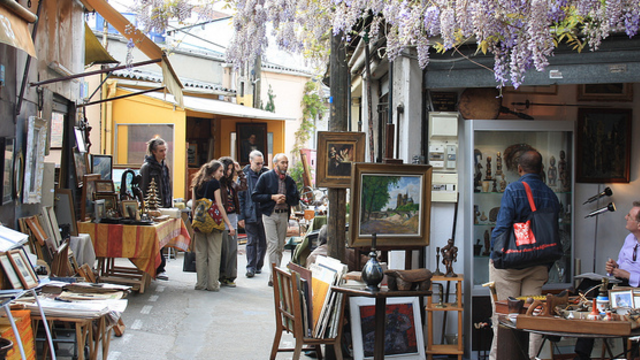 The Paris Flea Market is opened on Saturdays, Sundays and Mondays only. The market is completely closed the other days. As a guide, I'm free for touring on Saturdays and Sundays. The best time slot is from 11:30 am to 13:30 (shops open late because most traders live far from Paris). An alternative time slot is from 13:30 pm to 15:30 pm: the Market closes its doors around 17:00 pm but some traders anticipate closing when their sales have been good! Thoroughly enjoyed my time with Jean as we strolling the many flea markets that make up Les Puces de Saint-Ouen. Jean was adept at laying out the general plan of the Markets, and guiding me through the many small alleys and entry ways that are so easily missed by an overwhelmed 1st-timer. We began the tour in English (his English is perfect) but switched to French for the most part, which helped me in my language learning. At the end, I felt that he'd helped me develop enough comfort and confidence to return to Les Puces on my own, and enjoy. Recommended !! Jean is so nice and worked very hard to help us find our market treasures.. 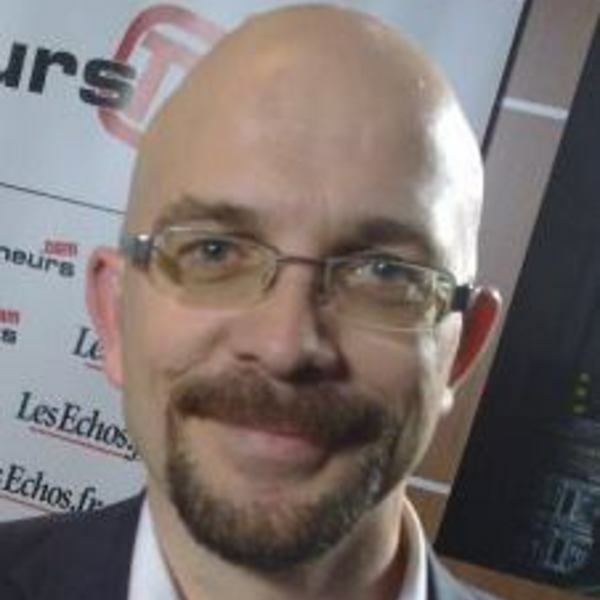 He is knowledgeable about the history of the area which made our experience interesting. He also helps with the bartering. It was a great time. We highly recommend. This tour is a must do if you're traveling to Paris! Jean can cater the tour to your interests, which makes this experience even more unique! Jean was very welcoming and made my boyfriend and I feel very comfortable! We had a blast walking around and exploring with Jean. There is SO much to see and in various nook and crannies that Jean knows very well! Trust me on this, you should definitely book this experience! You won't regret it! I booked two Vayable tours for my first visit to Paris last week, and both were wonderful experiences! Jean was such a pleasant and interesting companion to the huge Paris flea market. I wound up staying for 3 more hours after we parted, because he had helped me become so comfortable with my surroundings and we both knew I would be able to find my way back to the metro. I found a few great momentos of my time in Paris at the market, and I don't think I would have had the nerve to go there alone. I would highly recommend the Vayable experience and especially the flea market tour with Jean!!! Jean Christophe lead us through the Paris flea markets on a Saturday at the end of September and we couldn't have been more pleased with him being our guide! There is no way we could have navigated the maze of the flea markets without him. Prior to our arrival in Paris, I emailed JC some things that our group was interested in and he catered the tour to our interests. Very personal touch. Everyone in our group bought something and we had a great time just browsing and being amazed at everything for sale there. He took us into a little house that (there are a few) that have been converted into flea market shops. Was such a good time! I would highly recommend JC as your guide for the flea markets!